If you’re searching for a ceiling mounted shower head, it’s quite possible that you want to create a stunning, impressive, and relaxing spa-like shower experience. Nothing compares to the bliss and total relaxation of standing under a large rainfall shower head surrounding you in a drenching downpour of hot water. This ceiling mounted shower head by Juno Showers, that I review in the video below, is quite impressive! …At 24″ x 24″ square, it’s HUGE! 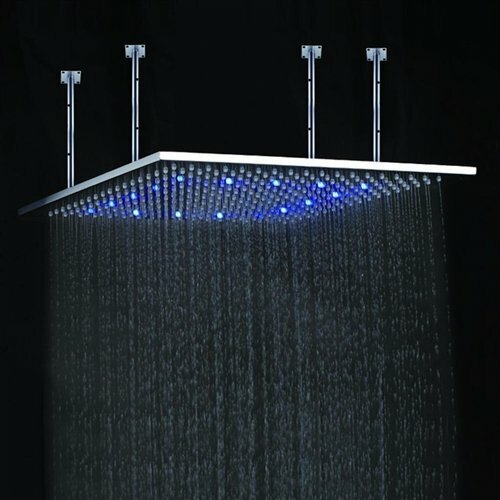 And, with it’s built in LED lighting, that is powered by water pressure, and changes colors as the temperature of the water warms, you’ll have one incredible shower experience. Ceiling mounted shower heads like this one are at the higher end of the price spectrum for overhead rainfall type shower heads, but if it’s high quality and luxury experience that you’re looking for, Juno Showers definitely provides that with this model! Stainless steel construction, with a brushed chrome finish – high quality & made to last! All necessary mounting hardware is included; 4 Stainless Steel shower arms, O-rings, screws, etc. The shower head changes colors according to the temperature of the water; blue for cold, green for warm, and red for hot…Never get scalded by entering into too hot of water!